In an ironic twist of fate this painting by William Hogarth, which was donated to the National Gallery of Art in Washington by the American philanthropist Paul Mellon in 1983, has been judged to be a fake by academics working for the Paul Mellon Centre for Studies in British Art. 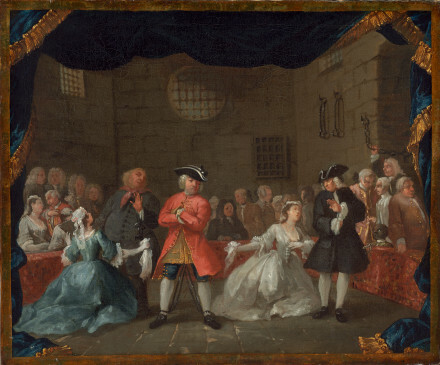 The painting, which was originally believed to be one of five versions of A Scene from the Beggar’s Opera that Hogarth painted sometime during the late 1720s, will be offically ‘outed’ as a forgery in a catalogue raisonné due to be published by the Paul Mellon Centre next month. Elizabeth Einberg, the British Hogarth expert responsible compiling the book, concluded that “The touch, the colour… the handling of the paint is not simply not the same” as that of a true Hogarth. Professor Robin Simon, author of Hogarth, France and British Art, alerted Einberg to the possibility of the work being a forgery after making close comparisons between the Washington painting and those known to be by Hogarth. He concluded that “Hogarth was incredibly careful to make sure you could recognise… individual actors [and their] roles in each of the four versions…. In the Washington picture you can’t make out anybody’s individual features.” Asked whether Mellon would be disappointed at the discovery, he said that the philanthropist and avid art collector would “fully approve” of any outcome which advanced our understanding the artist’s work. A copy of one of the genuine Hogarth versions of this painting can be seen here for comparison. This story was originally reported in the Sunday Times on 23rd October 2016 and can be found here. Here is an interesting and rather unusual example of a printseller using conder tokens as form of advertising. As we’ve previously discussed on the Printshop Window, conder tokens started out in the late 1780s as a form of private coinage used to pay factory and mill workers living in more remote locations. As the coins were usually only redeemable at sores owned by the worker’s employer, they essentially provided unscrupulous employers with a means of further reducing their labour costs by forcing employees to return a portion of their wages in exchange for goods. Over time conder tokens began to take on a life of their own as a cheap, durable, medium for advertising and as collectors items in their own right. 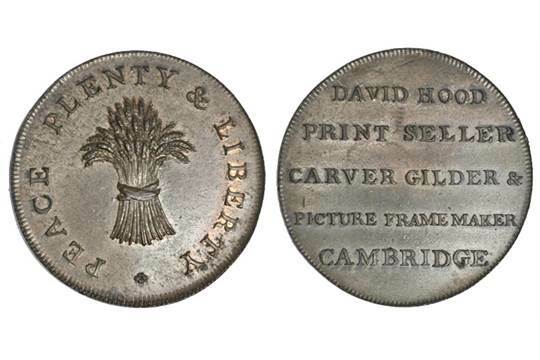 This coin was one of two known designs to have been minted for the Cambridge printseller David Hood. The second design, which seems to have survived in far fewer numbers, carries a coat of arms which the British Museum catalogue speculates may have belonged to a manufacturer named Richard Orchard who had commercial interests in London and Hertfordshire. The obverse face of the coin is stamped with a wheat sheaf surrounded by the words ‘Peace, Plenty & Liberty’. As the token is not dated it is difficult to interpret the precise meaning of the design. ‘Peace, bread and liberty’ was a popular slogan amongst English Jacobins during the early 1790s and a token carrying this design would mark Hood out as a political radical. However the conclusion of the Treaty of Amiens in 1802 also sparked a rash of prints, ceramics and other bric-a-brac celebrating the return of peace and prosperity. Personally, I suspect that the latter interpretation is more likely in this instance and have dated the coin accordingly. Hood was a Cambridge publisher and printseller who seems to have specialised in views of the city and the university in particular. One assumes that these items were intend to appeal to students or alumni who’d been sent up to the university, or those with an interest in its medieval architecture. 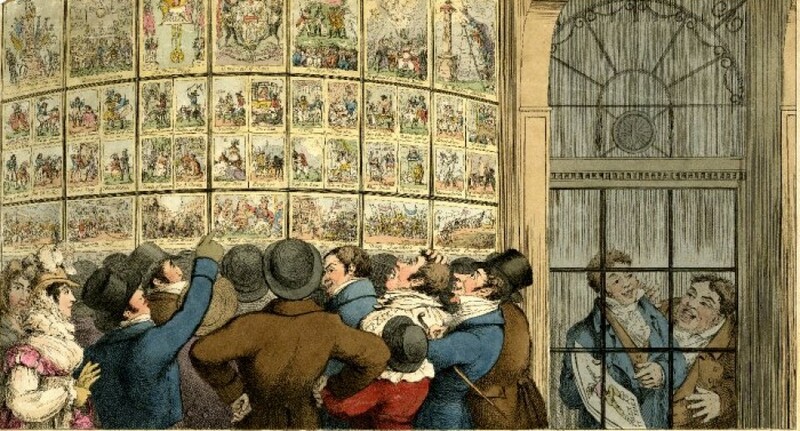 Hood’s surviving prints suggest that he was active during the late 1790s and early 1800s and formed links with the major London print publishers, including the satirical printseller S.W. Fores. For examples of prints published by Hood see here, here and here. Illustrated handbills such as this had been a staple product of English provincial printing presses since the mid-1640s. The subject matter of these bills usually fell into one of three broad categories – lurid accounts of murders, stories about supernatural events, or finger-wagging morality tales that were designed to keep working class readers on the straight-and-narrow. This handbill, which was published in Plymouth around 1830, neatly ticks all three of those boxes. It’s unsigned but may have been the work of someone associated with a local evangelical sect known as the Plymouth Brethren, as the sheet includes copies of a sermon, prayer and hymns which falls outside the standard Anglican liturgy. The bill has also been decorated with a crude woodcut adaptation of Hogarth’s Gin Lane that has been clumsily daubed with red, yellow and brown colouring. 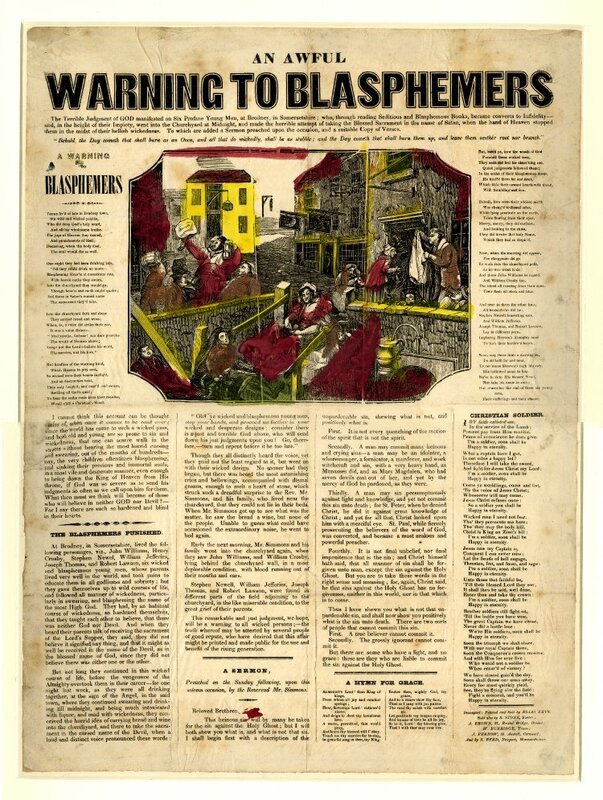 Although the image bears no direct reference to the content of the text it was presumably included to increase the commercial appeal of the bill and provide a visual counterpoint to the underlying message of the headline article. That article is reproduced here in full for the benefit of anyone who is thinking of stopping for a takeaway on the way home from the pub this evening. The terrible judgement of GOD manifested on six profane young men, at Brodney, in Somersetshire; who through reading seditious and blasphemous books, became converts to Infidelity, and, in the height of their Impiety, went into the churchyard at midnight and made the horrible attempt of taking the Blessed Sacrament in the name of Satan, when the hand of heaven stopped them in the midst of their hellish wickedness. At Brodney, in Somersetshire, lived the following personages, viz., John Williams, Henry Crosby, Stephen Newel, William Jefferies, Joseph Thomas and Robert Lawson, six wicked and blasphemous young men, whose parents lived very well in the world, and took pains to educate them all in godliness and sobriety; but they gave themselves up to wild courses of life and followed all manner of wickedness, particularly in swearing and blaspheming the name of the most High God. They had, by an habitual course of wickedness, so hardened themselves that they taught themselves to believe that there was neither God nor Devil. And when they heard their parents talk of receiving the Sacrament of the Lord’s Supper, they said they did not believe it signified anything, and that it might as well be received in the name of the Devil, as in the blessed name of God, since they did not believe there was neither one or the other. Though they all distinctly heard the voice, yet they paid not the least regard to it, but went on with their wicked design. No sooner had they begun but there was heard the most astonishing cries and bellowings, accompanied with dismal groans to melt a heart of stone, which struck a dreadful surprise to the Rev. Mr Simmons and his family who lived near the churchyard, that they could not lie in their beds. When Mr Simmons got up to see what was the matter he could see the bread and wine but none of the people. Unable to guess what had occasioned the extraordinary noise, he went to bed again. Early next morning Mr Simmons and his family went into the churchyard again, where they saw John Williams and William Crosby laying behind the churchyard wall, in a most deplorable condition, with blood running out of their mouths and ears. Stephen Newel, William Jefferies, Joseph Thomas and Robert Lawson, were found in different parts of the field adjoining the churchyard, in the like miserable condition, to the great grief of their parents. This remarkable and just judgement, we hope will be a warning to all wicked persons; – the truth whereof may be attested by several people of good repute, who have desired that this affair might be printed and made public for the use of and benefit of the rising generation.